At an event back in June, Microsoft offered a ‘sneak peek’ at some new features of Windows Phone 8, with the new start screen being the star of the show. While we weren’t told about devices, the past couple of months have given us announcement events from Samsung, Nokia and Microsoft’s new best friend HTC, but all parties have remained pretty silent when it comes to the full extent of Windows Phone 8’s new features. That’s all set to change today, as Microsoft is hosting an event in San Francisco to show off their new mobile operating system to the world – and we might even hear about Windows Phone 7.8 for existing customers too. We will be liveblogging the whole thing right here, so stick with us to find out what’s up Microsoft’s sleeve. 16:37 Google’s just dumped a whole load of Nexus news. Bear with us as we filter through it. 16:45 If you want to watch along with us, Microsoft has a stream for you. 16:48 A little over 10 minutes to go now. 16:57 The pre-stream music is actually horrible. 17:01 The announcer kindly asks everyone to turn their devices to off or silent. Not very blogger-friendly. 17:02 Here’s a table of phones. 17:04 And we’re off! Joe Belfiore is talking about why he loves his Windows Phone. 17:05 Big cheers from the Windows Phone fans in the room. 17:05 He’s talking about the successes of Windows 8, Surface and the San Francisco Giants. 17:06 Before he talks about the product, he’s going to talk about what’s happened in the last few months. 17:07 191 countries can now access the WP Store. 17:08 120,000 apps already available for 7.x devices. 17:09 Belfiore’s taking jabs at the iPhone 5’s ‘revolutionary’ fifth row of icons. 17:10 After recapping the core inspirations of WP, a video has come on soundtracked by Jonsi’s wonderful Go Do, showing off the individuality and stuff. 17:13 Let’s talk about live tiles. 17:14 Apps ‘light up the phone’. Live apps can integrate into the wallet and other hubs in WP8. 17:15 There is a new lock screen powered by ‘live apps’. 17:15 Photos, notifications and other stuff can appear. 17:16 Microsoft have partnered with Facebook to make an app that supports the lockscreen, showing various photos from your past. 17:17 Text on the lockscreen can also be customised. 17:18 New apps include Twitter, Draw Something, ESPN, Angry Birds Space and Groupon. 17:18 A new version of Skype is the highlight, based on the fantastic Windows 8 app. 17:18 It is integrated naturally into the phone experience and will run in the background. 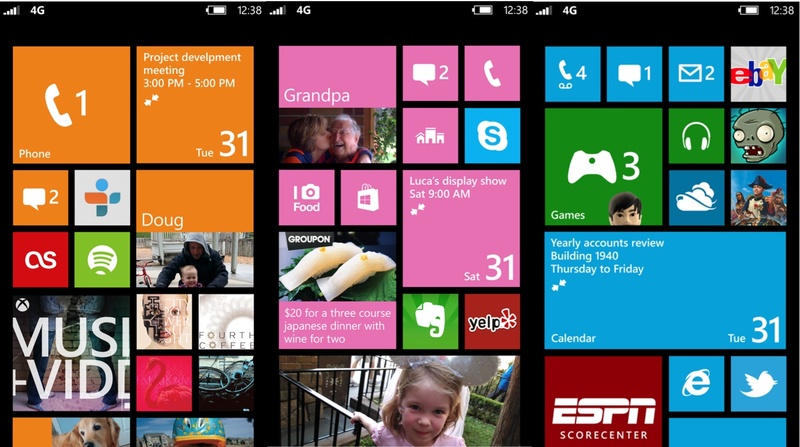 17:19 Soon Windows Phone will have 92% of the top mobile apps, including Temple Run and Urbanspoon. 17:20 Lots of Unity games will be arriving with the new native code support. 17:21 Pandora is coming with a year of complimentary ad-free music. 17:22 SDK stuff coming tomorrow at /build. 17:23 The Data Sense feature keeps you under your data limits. 17:24 IE10 compresses sites to use less data. 17:25 Data Sense can track down WiFi hotspots on a map. 17:26 As you approach your limits, it changes how the phone behaves with data. 17:27 45% more web browsing on the same data plan with Data Sense. 17:28 The first carrier to support Data Sense will be Verizon with the Lumia 822 and HTC 8X. 17:29 Belfiore’s moving onto ‘child mode’. 17:29 We have a video of children pleading to play on a phone. 17:30 Here are Joe’s children to demonsterate. 17:31 Alexander, 9, is going to play Battleships. 17:32 One of his children just called him ‘mommy’. Awkward. 17:33 This demo isn’t going too well. 17:34 If you don’t have kids, you can just disable the feature. 17:35 Now there’s an advert for it featuring Jessica Alba. 17:36 And here is Jessica Alba. Rapturous applause for her. 17:37 Twitter has just erupted with techies talking about Jessica Alba. This is unusual. 17:38 Apparently her daughter once tweeted to 4 million people. Kid’s Corner stops that. 17:39 She’s now talking about what she loves about Windows Phone. It’s the same-old personal stuff. 17:41 Now Jessica’s talking about her new company – The Honest Company. 17:43 The people hub now has a feature called Rooms. 17:44 They seem similar to groups. "This is like the best tech crowd I've ever been in front of." - deep thoughts from Jessica Alba at Microsoft's WP8 event. 17:46 You can share Rooms with iPhone users, including calendars and such. 17:47 On a related note, the Lumia 920 will be in UK stores on November 2nd, with the 820 coming 5 days later. 17:48 Now Joe is talking about SkyDrive stuff. 17:52 Xbox Music will also be available on Windows Phone 8. 17:52 Playlists and song choices sync across the cloud. 17:53 All of your content is with you wherever you are. 17:54 Joe’s walking off now, but Ballmer is in a new advert. 17:55 He’s talking about the successes of the weekend again. 17:58 Steve is talking about personalisation and the connection to Windows 8. 18:00 Now he’s talking about the killer hardware, starting with the Nokia Lumia 920. 18:01 Next is the Samsung Ativ S.
18:02 And now the Windows Phone 8X by HTC, Microsoft’s flagship. 18:03 All three and more will go on sale in Europe this weekend, while in the US phones will follow soon after. 18:04 Verizon will carry the 8X ($199), Lumia 822 ($49) and Ativ Odyssey (exclusive in December). 18:05 T-Mobile will have the Lumia 810 ($99) and 8X ($149). 18:06 AT&T will have the 8X, Lumia 820 and Lumia 920 exclusively. Pricing is to be confirmed. 18:07 Microsoft stores will sell all US phones in November. 18:10 Jessica, Joe and Steve are out to wrap things up. Also the stream has died. 18:10 And that’s all folks. We’ll be off to get some hands-on time this weekend, and (hopefully) bring you some news on how Microsoft plans to treat its existing customers. 18:11 See you next time! Thanks for joining us.